Now this is one I really struggle with, as I’m sure many of you do too: how to tell your story by showing rather than telling. OK so that’s a bit of an odd way of putting it perhaps, but it’s something that’s vital to remember if we want to improve our writing. I’m sure we’ve all read books where we’re thinking ‘this author’s just going on and on, why can’t they let me figure it out for myself?’ I know I have. The trouble I find as an author is getting it right, so that I give my readers enough information for them to know where they are in the story and what’s happening without bombarding them with too much information. How do we start to show rather than tell in our stories then? Well I’m finding that it can help if I’m not too obvious in the detail I give. Keep it subtle; rather than saying ‘she was sobbing and sobbing’, why not say ‘her face was wet with the many tears running down her face’. Maybe that’s not a great example, so here’s another: instead of ‘the sun was shining and the old man was very hot’, why not try ‘the sun was scorching on the old man’s back and he felt beads of sweat begin to run down his face’. There are plenty of other examples I could use but you get the idea. Showing rather than telling means that the reader has to work a bit harder to discover things about the plot. And, in my opinion, is rewarded more for it. It makes for an interesting story for the reader if he/she is kept guessing a little. I will admit that I’m not entirely keeping to this rule. Because I’ve told rather than shown in my writing in the past, I’m finding it quite hard not to do that in my current WIP. It’s not easy. But I guess that’s the whole point about writing: it’s not always easy and to improve your writing style, you have to practice and persevere to see results. I’m learning from other authors, self published and traditionally published. It’s fascinating to me to see where other authors get it right or wrong. Reading widely is vital if we’re to gain a sense of exactly how it is that we can write in a subtle yet informative way. Because we can still tell a story through showing; it’s just going to be that much more nuanced and interesting to the reader. I agree, this is one of the hardest parts of writing. 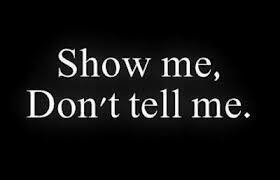 I keep chanting “Show, don’t tell” as a little mantra! I have trouble with this, too! There are some times when an info dump can be the way to go, but it’s knowing the difference. I think subtlety is definitely a good way to find that balance. I think I’m gradually finding that balance. It’s not easy though. This is tough. Sometimes I don’t realize I’m in telling mode until a beta reader circles something on my manuscript. But showing emotion is very tough, but necessary for a reader to feel the emotion. A great craft book on this is WRITING FICTION by Janet Burroway (and others). I think it is tough to remember what not to do. I find myself writing stuff that’s fairly obvious, but sometimes it’s so hard to keep showing rather than telling. Thanks for the book title. I’ll look it up on Amazon.